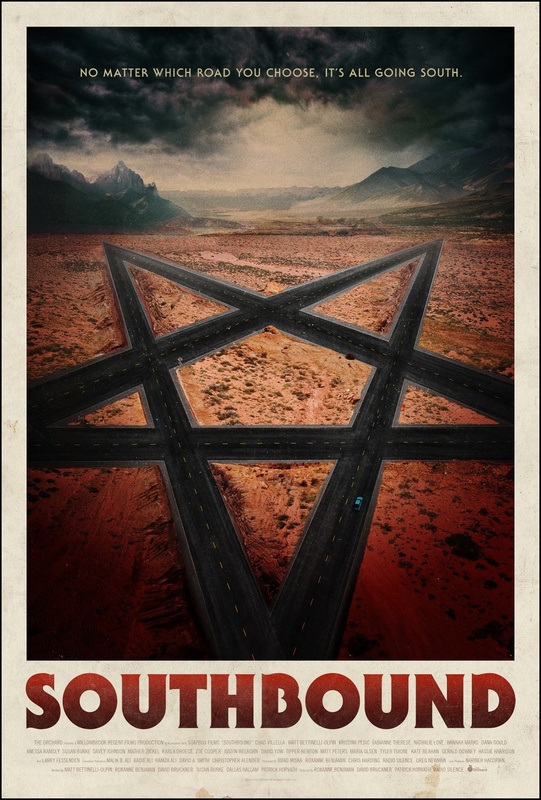 Chrichton's World: Review Southbound (2015): Horror anthology film without the horror! Review Southbound (2015): Horror anthology film without the horror! Southbound consists of 5 tales that are connected where it's not always clear when one story starts or ends until you get introduced to new characters. Were these stories compelling? To be honest none of them really grabbed me. Because right from the start it's clear what is going on. I mean not in full detail. But in general you will be able to deduce it. Most of the stories are abstract and surreal but it doesn't matter whether they make sense or not. You see, the opening story gives away far too much. It's about a place where some people go when they have been very naughty. Once you know every event in this film becomes a bore since you can predict the outcome every time. To be fair the film is technically and visually solid. Most of the performance are decent to good. Everything else though is bad. There are enough suspenseful moments and scenes that were pretty graphic and gory. However the film never ever delivered on scares, dread or surprises. Some of the stories were close to offering that but problem is that you aren't really invested in the characters since you hardly get to know them. Maybe some scenes made me root for them. But then there were other scenes that made me prevent from having any sympathy or empathy for these characters. In hindsight that is the whole purpose of those stories. What is the point of a horror anthology if you fail to offer any scares or surprises? Gore alone is not enough. If you are going to make a film about that place bad people go then you have to really depict it in a way that it's truly terrible, horrific or dramatic. This never happens. Instead I was struggling to stay awake. There was nothing compelling for me. There isn't even a brilliant twist or turn that steers you into another direction. A complete wast of time. And not because I didn't get it. I got it. Perhaps that is why this film fails since it doesn't go beyond the depiction. It's too superficial.